This cosy holiday home with open fireplace, sauna and play equipment is situated on a private wooded estate with a small stream. In the living room you'll find the cosy seating area with open fireplace and the dining area with large dining table. From here you can access the south facing terrace. The kitchen is spacious and features all modern comforts. If you want to completely relax enjoy the relax room with sauna. There also is a play room with foosball and in the shed you'll find a table tennis table. Holiday home Bois et Nature is situated in the heart of the Hoge Venen at an altitude of 550 metres. The region offers many activities such as golfing, skiing, canoeing, swimming and many more. You can walk to the romantic castle of Reinhardstein. 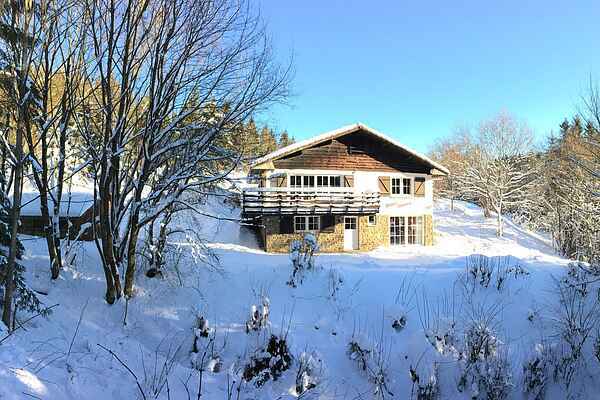 The house isn't far from the Hoge Venen nature reserve (2.5 kilometres), the ski slopes of Ovivat (3 kilometres), the lakes of Robertville (4.5 kilometres) and Bütgenbach at 14 kilometres. In case of heavy snowfall you have to park the car at 25 metres from the house (still on the premises). Our holiday houses are especially furnished to accommodate families.